The chestnuts add a lovely bite of sweetness to this dish. And the port helps add some sweetness too. This is an adaptation of a recipe for Venison and chestnut stew. I’ve made the original just leaving out the flour and adding less liquid, and it works very well. Beef is a good substitute though and much more widely available. I also add in mushrooms and carrots. This goes well with rice but it tastes best served with creamy mash potatoes with chopped chives. You can find chestnuts in some stores at this time of year. I’ve never cooked them from raw. I know they smell gorgeous while roasting. But I also know they’re a bit of a pain to peel. So I use the vacuum-packed variety which work very well in this. Chestnuts are quite good for you apparently. They are said to be a good source of manganese, copper and magnesium, as well as being full of vitamin C, B1, B2, and B6 and folic acid. Beef is also nutritious, being a great source of iron, B12 and protein. And there’s rashers in this so it really is full of protein. Try to make sure the beef you use is quite fatty. It may not be the healthiest but it’s best for stewing and it makes the whole thing taste more creamy. The beef I bought for this was labelled slow-cook beef – and it’s very good beef – but to be honest next time I’ll be buying a fattier cut. The streaky bacon rashers will help – but also don’t pick lean beef for this. Stewing beef, beef stock, rashers, chestnuts, onion, carrots, celery, thyme, garlic, juniper berries, tomato purée, mushrooms and ruby port. Turn on the oven to 140 C.
Heat some oil in a large casserole pot. Brown the beef on all sides on a high heat and remove them to a plate. Reduce the heat and add the carrot, onion and celery. Cover and sweat for a few minutes. Add in the mushrooms, turn up the heat and cook for a minute or two. Add in the sliced rashers, stirring them around until they have lost their raw pink colour. Add back in the beef. Stir in the thyme, garlic and juniper berries. Pour in the stock and port. Stir in one teaspoon of tomato purée and stir around well. Place some foil or an old butter packet wrapper over the stew. Cover the pot with the lid and transfer to the oven. Cook for an hour. Remove the foil wrapper. Stir in chestnuts. If the sauce hasn't thickened add in another teaspoon or so of tomato purée. Leave to cook for a further 30 minutes. Serve with rice or mashed potatoes (with some fresh chives mixed in). 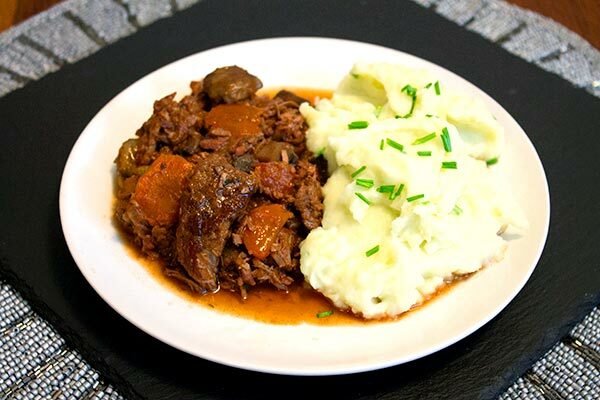 Beef and chestnut stew served with creamy mash with chives.